The name “wisdom teeth” is age-related, as third molars don’t erupt until teenage years and beyond, when people theoretically are wiser to the world. While wisdom teeth do grow in straight for some people, in most cases people experience problems with their wisdom teeth. Problems may arise because the teeth erupt too close to existing permanent teeth, causing crowding, improper bites, and other issues. Since most mouths are too small to accommodate four additional molars, wisdom teeth removal is often necessary to prevent other dental problems, including impaction or the shifting of neighboring teeth. Impacted wisdom teeth are prevented from erupting, cause infection, gum disease and even the formation of a cyst. Recovery after your wisdom teeth surgery varies from person to person, with full recovery taking up to three or four weeks. Once you have undergone surgery, there are several important steps to take in order to ensure proper healing and recovery from your procedure. During the first 24 hours after wisdom teeth removal, you can expect some bleeding to occur. To control bleeding, you can use a moist, clean piece of gauze placed over the extraction site. Biting pressure applied for 45 minutes should help stop any bleeding. 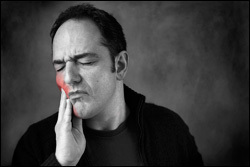 Additionally, facial swelling is also common after wisdom tooth extraction. To relieve swelling you may wrap ice in a cloth and apply it to the swollen area for 10 minutes and removed for 20 minutes. This cycle can be repeated as often as necessary during the first 24 hours following your procedure. Do not rinse your mouth during the first 24 hours immediately following extraction. Stick to a soft or liquid diet the day of and the day after a tooth extraction, gradually progressing to eating other easy-to-chew foods. After the first 24 hours, gently rinse the socket with warm salt water after meals and before bed, as to prevent dry sockets from forming. Your dentist will work with you to explain an appropriate post-care plan for your specific needs. If you are experiencing pain with your wisdom teeth or any other symptoms, contact your dentist in Lexington, KY for further treatment. Waiting to have your wisdom teeth removed, or extracted, until there is a cause for medical concern can increase the risk for complications to increase. Ultimately, problematic wisdom teeth should potentially be removed by age 18 to prevent further complications. For more information on Wisdom Teeth in the Lexington, KY area​ call Erena & Peterson, PLLC at (859) 268-4423 today!